“Time is money” may be a business cliché, but its truth is not to be denied. How you use your time when working for a company can influence your salary and your job security. How you do so if you are self-employed can impact your earnings. One way to use time most efficiently is to schedule tasks and track the time spent on them. Another way is to automate recurring tasks instead of performing them manually. You can automatically prepare and send invoices, for example. Time used efficiently usually translates into time saved and increased productivity. Somewhat ironically, the best way to save time and/or use it more efficiently and effectively is to back off a bit. It is better to put forth a little less effort, instead of simply working harder. That is precisely what the following apps will enable you to do. 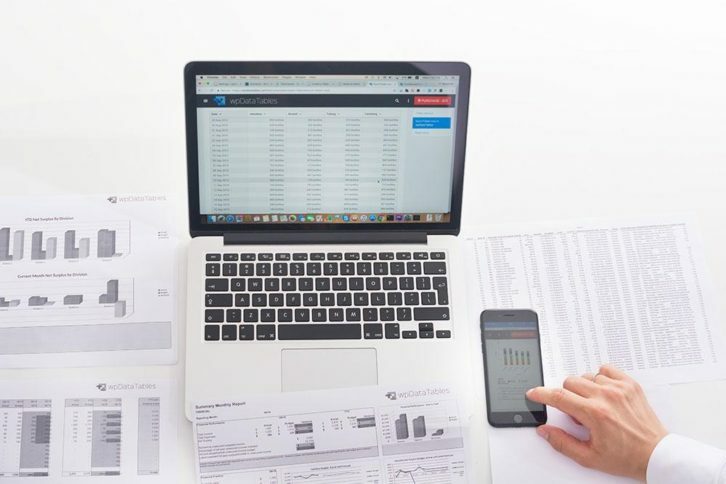 Small, service-oriented businesses will find the FreshBooks app a particularly useful tool to use for expense management, time tracking and invoicing activities. FreshBooks has proposal-generating capabilities that really improve productivity as they provide a framework where project outlines, timelines and scope can be detailed. These proposals can then be automatically converted into invoices with a single click. Having an established format and style within such a framework is a big timesaver, and with FreshBooks changes are easily made whenever necessary. Success breeds success. It’s an adage, but recent scientific studies have shown that once you achieve some success, more is apt to follow. That’s also true of WordPress, the premier website and blog creating platform. WordPress’s popularity continues to grow. More web design entrepreneurs and companies are turning out more themes and plugins. WordPress happily supports these. You might even be tempted to say that WordPress has become too successful. This can happen when you realize there are thousands of themes and plugins to choose from. Some are better suited to your needs than others, but you really don’t have the time or patience to try them all. We’ve chosen 9 of the best on the market to help you out. Pick one, two, or all nine. Be prepared to be amazed at the design features you can easily incorporate into your website. The data management tasks involved in building a well-structured, easy-to-comprehend table or chart can be formidable. This is especially so when you’re dealing with large amounts of complex data. You not only need to know what data to present, and how to present it, but how to come up with a result that is precisely what users need and are looking for. wpDataTables is a best-selling WordPress plugin that does all the difficult work for you and does so in minutes instead of hours or even days. You should be prepared to be amazed at the power and flexibility this premier plugin brings to the table. wpDataTables accepts data from a variety of sources and in a variety of formats, and produces colorful, responsive, and easily maintainable tables and charts without any need for coding on your part. This is a must-have plugin if you work with large amounts of statistical, scientific, or financial data, if you have a product inventory or catalog to manage, or if you simply have large amounts of data you need to keep organized. LayerSlider is a premium multi-purpose animation platform that can do much more than simply add pleasing slider effects to your websites or blogs. With this versatile plugin, you cannot only create sliders from a variety of different layouts, but you can generate slideshows, animated popups and page blocks, image galleries, and even landing pages and complete websites. LayerSlider is device friendly, so your image galleries, sliders, slideshows, etc., will be displayed correctly on desktops, tablets, and smartphones alike. Insofar as slide layouts are concerned, you can choose among full width, full size, hero scene, and OS native fullscreen. One of the typical tasks almost each site creator eventually needs to solve is a requirement to display huge amounts of data to the site visitors in a readable and interactive manner. A classic solution is organising the data in a table. If you deal with data management on your website, you should know about wpDataTables. This is the number one WordPress plugin for tables and charts. wpDataTables takes any amount of data and organizes it on your website. It does so quickly and efficiently so you can avoid five major issues. Putting together a price list or product catalog on your site can be time-consuming. You will sometimes need to manually craft a table or chart. 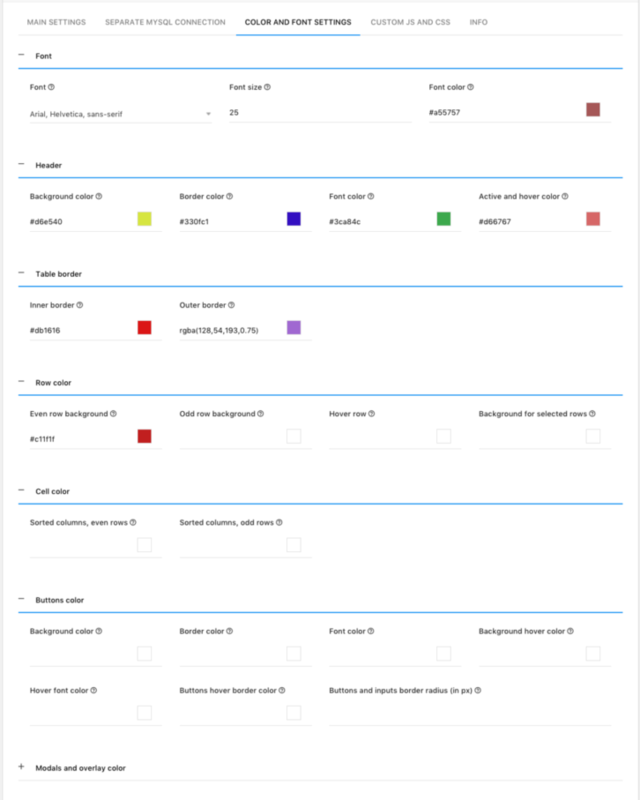 Then, you might need to align it to fit the page, and then to pour in all the data to form neatly organized columns. This process can be a giant waste of time. Solution: wpDataTables will spare you a lot of time as well as frustration! It will manage your data for you in a matter of minutes. For example, you might already have a table in Excel, Google Spreadsheet or MySQL. In this case, you can create a table on your WordPress site with wpDataTables in a couple of clicks. Or, by clicking Add New you can have a new table in two seconds flat. After that, all that is left is organizing your data and optimizing your design with just a few clicks. Here is exactly what you can do. Use foreign keys for MySQL-based tables. Typically, you would need multiple plugins when you work with complex data. That means time spent learning how each and everyone works. It might be hard to figure out the strengths and weaknesses of different plugins. What is more, merging them is a huge headache. Some plugins may cause conflicts when installed on same WordPress installation. Solution: Using wpDataTables you can create and organize your information anyway you want. You can also use the built-in Chart Creation Wizard to turn your data into a graph or chart. It only takes a few clicks. Three render engines can be used; Google Charts, Highcharts, and Chart.js. Also, you can easily insert a form on your website. To do this, you can take advantage of a wpDataTables add-on that integrates Gravity Forms. Here are some of the most appreciated features of the Gravity Forms integration add-on. Show any form fields as table columns. Display all the entry’s additional information (IP, DateTime, User ID) in a table. Show or hide deleted entries. Use all of wpDataTables power once you create the form – sort, search, filter, and navigate through Gravity forms data as through any other wpDataTable. Adding a major amount of data can compromise the design of your site. The design is the first thing to go when organizing a large quantity of data. 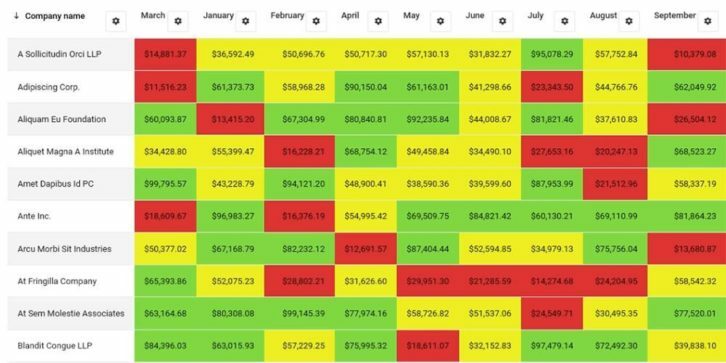 Often you risk a well-organized, but an ugly-looking table that takes over your site. Solution: wpDataTables allows you to adjust the table design to your liking. You can do a lot with wpDataTables for matching your style. This includes quick colors, font size, editing columns to its appropriate type. The most important thing in data management is easy navigation. You want any visitor to your website to be able to find the precise thing they are looking for. Even if you have millions of rows. Solution: wpDataTables has put extra effort into the filtering features. This allows creating an easy and intuitive navigation experience. If you wish for an even better navigation and filtering experience you can use Powerful Filters. A multifunctional addon. It will extend default functionalities in several ways. Cascade Filtering – filter values in order from left to right. Selection in each filter will enable next one and narrow down the options in it. Independent Cascade Filtering. Lose the restriction to define filter values from left to right. Any filter narrows down all others. Hide Table before filtering – keep the table hidden until a selection is made in the filter. Search Button – make the table apply filters only when the Search button is clicked. The trouble is that loading a page with a large amount of data can take forever. All your efforts to organize your massive data will be for nothing if it takes a long time to load. No one wants to wait longer than a few seconds before they move on from your page. 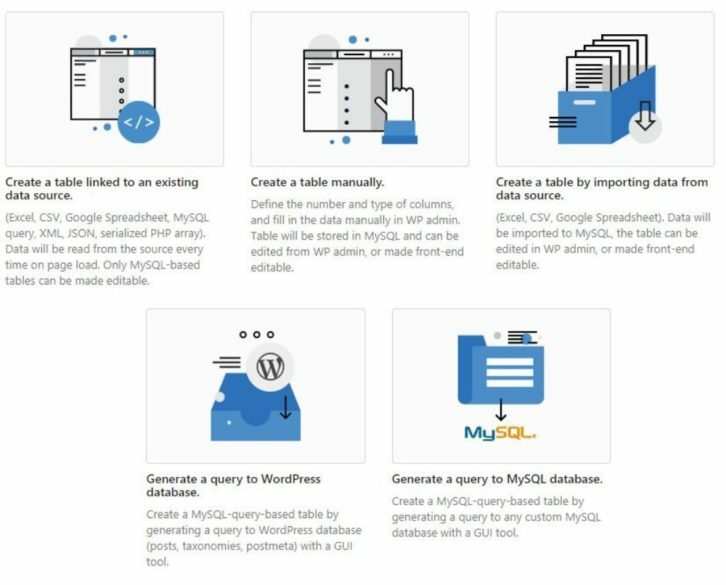 Solution: wpDataTables automatically creates responsive mega tables. Do you think wpDataTables is for you? With wpDataTables, you never have to worry about writing code. 16,000 people have chosen this plugin because of its time-saving functionality. Even without tech skills, it is rated high as an easy to use the plugin. So, if you need to gather and publish data in all its forms, you can easily use wpDataTables to manage them. Why waste time with messy, ugly charts when you can use this simple plugin and addons? All the headache causing tech issues can be removed from your day. wpDataTables relieves the struggle of displaying massive amounts of data. There will be no need to compromise load speed, navigation or design. You can have the website of your dreams with less mess and fuss. There is one thing web designers like about multipurpose WordPress themes. It is that they can be used to build virtually any type of website. It can be for a creative type, a small business, a corporation, or a cause. A counter-argument is that multipurpose is a “jack of all trades, master of none”. Nothing could be farther from the truth. Multipurpose themes are more than capable of handling any web design task. The 15 described here can yield results you and your clients will be more than proud of. The widespread popularity of these 2018 themes enjoy more than proves the point. BeTheme is big. It’s big in terms of its selection of pre-built websites (more than 320), the number of core features you have access to (40 or so), and the number of satisfied users (thousands). The only small number associated with this premium multipurpose theme might be its ThemeForest best-seller ranking (it’s in the top 5). Be’s large number of customizable pre-built websites is a blessing if you land a client that operates a business that could best be described as rather uncommon if not unique. You’ll feel doubly blessed if your work involves clients from a range of business type and niches. Locating a pre-built website that’s a great match for a given client’s needs typically takes minutes, rather than consuming hours of your valuable time. Be’s Muffin Builder and Options Panel, together with its impressive array of shortcodes will do most of the heavy lifting for you. It’s not uncommon to be able to have a completed website up and running and ready for delivery in roughly 4 hours. BeTheme is definitely worth looking into. Use the Total drag and drop front-end visual page builder and the WordPress Customizer to create your website, monetize it, and you’re ready to set up shop. While you can create any type of website for virtually any purpose, Total really shines when used in the design and creation of eCommerce sites. Total is fully compatible with and supports the WooCommerce plugin and is bbPress compatible as well. Total is delightfully easy for WordPress users to work with. You can view the demos on the WordPress dashboard and click to install any demo you intend to use. At the same time, you’ll be prompted to install any plugins that may be required. Then it’s simply a matter of putting your website or eCommerce shop together. Beautiful web pages aren’t always enough to keep a visitor engaged. In fact, if a site’s UI and UX aren’t carefully designed, visitors aren’t apt to stay around for long. Consequently, there’s a huge and ever-growing demand for UX designers. Salaries that are in keeping with the demand make the thought of diving into UX an attractive one. If you’ve already gone this route, you need to understand the importance of having the proper UX tools. You need to know what they are, and what they do. These tools include support collaboration, prototyping, interactive design, and user testing. User flow diagrams make up an important piece of the puzzle. So does the ability to tweak specific design elements. These can be changed during the design phase and after product deployment. Here are 7 top UX tools, any one of which can make your work life a lot easier. Mason’s simple visual interface enables you to design real digital and software features without having to resort to building mockups or prototypes, and the overhead expenses they sometimes entail when handed over to engineering for comments and feedback. Mason allows you implement your design exactly as you built it, all without a single line of code. The QA process involved in ensuring that the final product matches the design is eliminated, and you can make edits and changes immediately via the Mason platform, and watch them go live in real-time. This is a radically different way to build, modify, deploy, and maintain desktop and mobile features. Radically doesn’t mean complex or difficult either. Mason’s creators have followed the best design practices and solutions. Mason’s feature-building process is straightforward, and you’ll realize significant savings in time and overhead expenses, and the team collaboration process will be smoother and more efficient and effective. Another of Mason’s benefits is that it doesn’t lock you into specific platforms or hosting environments. You can simply work with a tech stack that makes the most sense to you. Most of you would agree that designers find it difficult to tell a story with their designs, and to communicate their design thinking process to convey the message they want. Not anymore. Overflow is the first-ever user flow diagramming tool created specifically for designers. It gives designers and product managers the flexibility to present their ideas in an impactful way, by navigating between their screen designs comfortably and focusing on the details when needed. Overflow is a cross-platform tool that integrates seamlessly with the most popular design tools, allowing designers to design, present, share & print their user flows, all in one place. So in other words, Overflow makes designers look good and keeps their audience captivated so that they can follow the story throughout the entire user journey. The longer you can keep a visitor tuned into your website the better. But the time needed to fully engage a visitor is quite short. If your website UX isn’t up to snuff, you’ll be fortunate if a visitor sticks around more than 5 seconds. That isn’t much time to sell a product or service, or even get your message across. You might have the skills and tools to create a UX you can be proud of. Yet, your efforts can come to naught if you make any of the 5 mistakes described in this article. Do not show your visitors all the different styles you can use when you design web pages. Web users prefer consistency. They like to know that page 4 belongs to the same website as does page 1. Stick to the same color scheme throughout your web, mobile, social media presence. The same applies to fonts. Keep the number and sizes of fonts to 2 or less and 4 or less, respectively; as shown in this BeDecor example. You should also avoid using unnecessary or superfluous font weights. They contribute little if anything and can slow page loading down. As illustrated in BeYoga2, readability is best when the line height is the same. The good use of white space is also important. Your typical user generally has a quite short attention span. That’s one reason to avoid slow loading pages. But, it’s more important for a site to feature a UX that attracts and engages visitors and keeps them engaged. 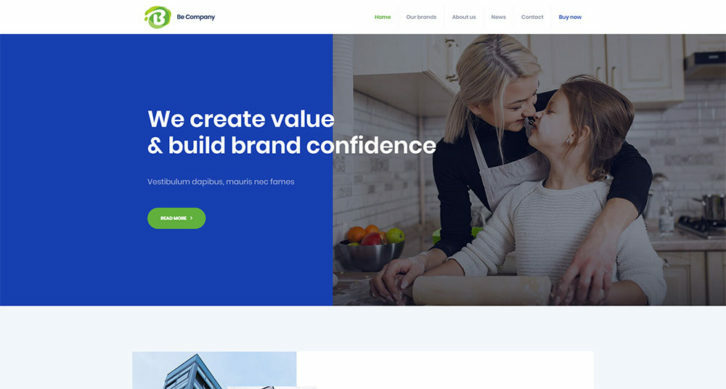 BeCompany is an excellent example of such a website. If this headline caught your eye, it likely means you’re in the hunt for the best available website builder. Finding “the Best” is not an easy task. There are plenty of good website design tools available, many of which lay claim to being “the best”. So, which one do you choose? We’ve made it easy by presenting what we believe are the most advanced site-building tools on the market. These site-building tools offer perfect solutions for designers and small-business clients. If you are on the low budget, these tools are also for you. The next step is up to you. All you need to do is select the tool that best suits your needs. Do that, and you will have found “the best” of the best. Download the Mobirise Website Builder and use if to create your personal website or one for a client without having to deal with any restrictions. Mobirise is free to use for both personal and commercial projects. The Mobirise Website Builder offers numerous themes and Bootstrap 4 templates featuring everything from sliders, galleries (with lightbox), and full-screen intros, to counters, countdowns, progress bars and data tables. 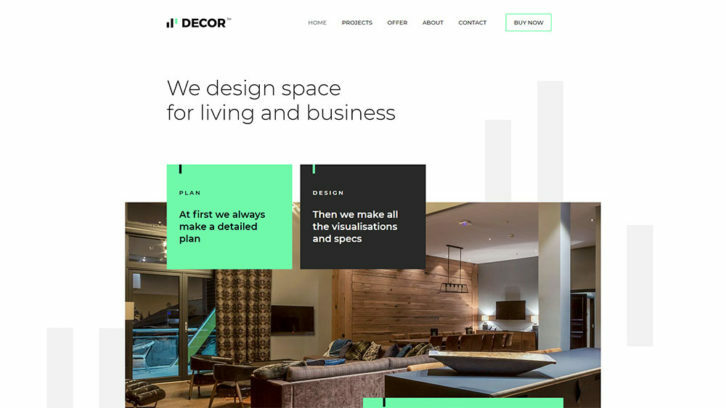 What you’ll really like about this website builder are the flexible, pre-made website blocks that you can combine in many ways to build your tables. Just drop these blocks and other design elements onto your page, add your content, and make any necessary adjustments to style the page as you like. Visit the website and download Mobirise for Windows or MacOS.